The High Court has ruled against parts of an appeal by a landlady convicted of using foreign satellite feeds to show live English Premier League football. 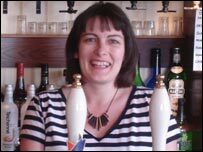 The appeal was brought by Karen Murphy, landlady of the Red, White and Blue pub in Southsea, Hampshire. It is a test case for pubs throughout the country that use satellite systems from countries such as Greece and Morocco to show live English football. The appeal may resume to consider aspects of European law in the case. Lord Justice Pumfrey, sitting with Mr Justice Stanley Burnton, dismissed the appeal based on domestic law. He said that BSkyB had the exclusive right to screen or broadcast the matches in question in the UK and it was "apparent" that Ms Murphy knew that was the case. But he added that the court had not heard arguments about whether European competition and free movement legislation might affect the case. The appeal will therefore be reopened for a day next year to decide those issues, he explained. In their statement, the judges said that while they may not have heard some of the arguments, they decided that the "English provisions" are consistent with European Commission legislation. "So far as the competition law case is concerned, we do not at present follow how it is to be developed, and this appeal must therefore be restored for these points to be argued if that is what the appellant want," they said. Ms Murphy received feeds of live football and equipment from the Greek broadcaster Nova, which charged her about £800 a year, compared with the £6,000 a year that she would have to pay satellite TV firm BSkyB for the service. It also allowed her to show live games on a Saturday afternoon at 1500, which the Premier League does not make available to companies broadcasting in England. "We hope that publicans and others will now heed the advice of the courts and accept that the use of foreign satellite systems to screen Premier League football in the UK is copyright theft, pure and simple," said league spokesman Dan Johnson. But Ms Murphy's lawyer Paul Dixon stressed that the case was not yet over. "In footballing terms, we are in the half-time interval, and every football fan knows that the game is never over and nor is the result certain until the final whistle," he said. "We have always said that this case is all about European law, and the High Court has not yet heard argument on the European Union issues," he added. There are several companies that install foreign satellite equipment in pubs in the UK, including Digital Sales, which is run by Joe Ibrahim. Mr Ibrahim claimed that the ruling was unfair, and not consistent with copyright rules that covered other products. "If what we're doing is illegal then it will stop people bringing European cars into Britain and if you buy a DVD in Europe and have it shipped to you in Britain then that will be deemed illegal too," he said.